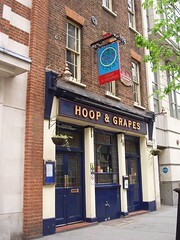 A pub just near Ludgate Circus, and not too far from City Thameslink Station in the City, formerly owned by Hall & Woodhouse, and now allied to Kent brewers Shepherd Neame. This is a cosy and well-run place. There's seating downstairs, stretching back quite far with tables out front and booths in the back, as well as a function room upstairs. Out the back is a compact beer garden on several levels. The small bar has a good selection of spirits and a decent wine list (175ml glasses of a selection of good wines were priced from £3-£5). They also have three handpulls for ale, with Bishop's Finger, Spitfire and Early Bird available on an April 2009 visit. The lagers are the same as to be found in many SN pubs, including Oranjeboom, Holsten Export and Asahi. They are particularly welcoming of bookings, and will open on the weekend for private parties for no more than a refundable deposit and no minimum spend stipulations. Staff are friendly and approachable. Last visited by Ewan, Jo and friends, 4 April 2009. Last edited 2017-09-15 17:30:27 (version 5; diff). List all versions. Page last edited 2017-09-15 17:30:27 (version 5).